The Genesis Mini was revealed as part of Sega's Fes event, which is taking place in Tokyo, Japan, and is scheduled to launch worldwide on September 19. It will cost $79.99 US/£69.99/€79.99/AUD$139.95 and have 40 games. 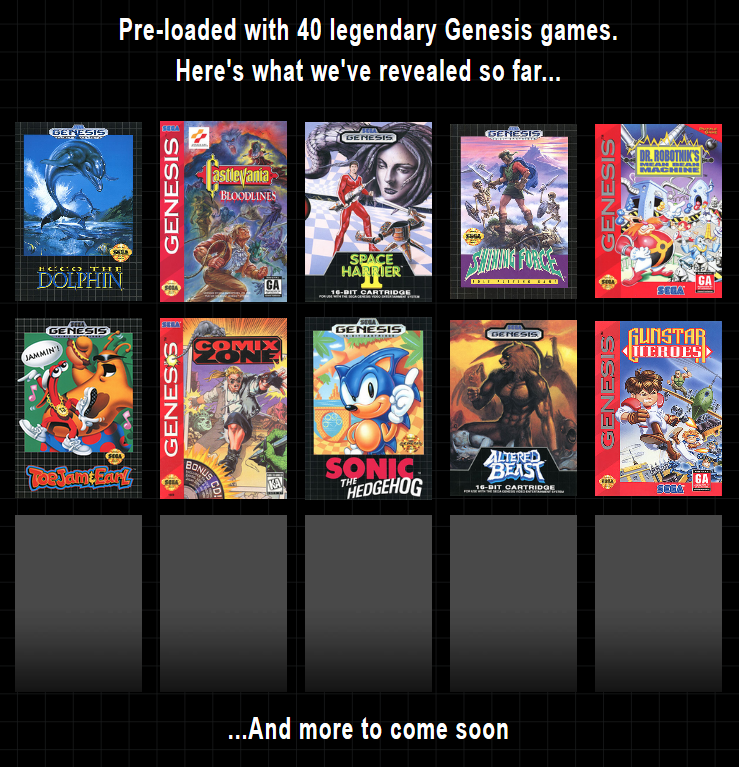 The company has confirmed that this list of titles includes Sonic the Hedgehog, Ecco the Dolphin, Castlevania: Bloodlines, Space Harrier 2, Shining Force, Dr. Robotnik's Mean Bean Machine, ToeJam & Earl, Comix Zone, Altered Beast, and Gunstar Heroes. Sega has said the remaining games will be "announced intermittently over the coming months." 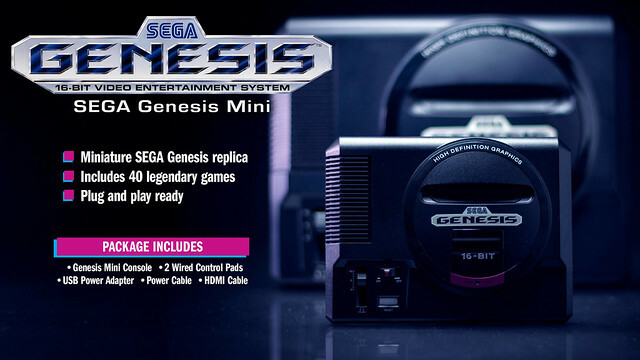 The Sega Genesis Mini is based on the Model 1 Genesis, except is approximately 55 percent smaller than its original incarnation, according to Sega. In the box will be the Genesis Mini, two replica three-button USB controllers, one USB to Micro-B power cable, and one HDMI cable. In North America a power adapter will also be included. The game ports that are on the Genesis Mini were handled by M2, a team that is well known for its work on emulation and re-releases. M2 previously worked on Sega Ages and Sega 3D Classics Collection. Needs Jurassic Park Rampage Edition and Judge Dredd before I would consider a purchase. Same as the PS1 needed Silent Hill. Without it, there wasn’t a ton of reason to buy it. I’m also hearing that the C64 Mini is getting an upgrade to a full-sized C64. That is something I would totally buy and use. All games shown so far are solid. Nice to see third party titles in the mix! I used to own all of the carts shown in the image brandonjclark posted. I gave away my Genesis and SNES to my cousin, who is about eight years younger than me. His mom gave them away years later, along with a bunch of toys, to the church. He's wealthy now. He always pays for dinner and drinks, so I'm not complaining. I'll pick it up for Castlevania as I never played Bloodlines. Been waiting a long time for a real Genesis Mini! If you do not OWN ALL the next generation consoles and you always rant and rave about the other you do not OWN, you my friend are a FAN BOY.